We can assist you with your commercial espresso machine needs all over the UK; call us on 0203 096 7233. 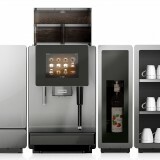 We have commercial espresso coffee machine showrooms in central London and Falkirk and we are a friendly and laid-back family company, we can advise, supply and integrate and offer training and quality point-of-sale material, coffee and ancillaries. We stock a wide range of commercial espresso machines and espresso coffee grinders, tamper, waste drawers, foaming jugs and patterns for quick dispatch and installation anywhere in the country. It is important to feel confident and at home with your espresso coffee machine so that you are relaxed with producing consistent and outstanding coffees like cappuccino, caffe latte, flat white and espresso time after time. 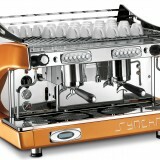 Espresso Machines of proven brands like ESPREZZI or SYNCHRO or CIMBALI. Waste Drawer in Polished Chrome. Chocolate Shaker and Foaming Jug. 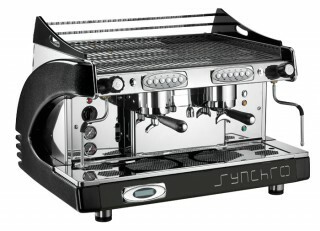 The Synchro 2 group espresso coffee machine has 2 group heads and an 8 litre or 14 litre boiler and is available as compact or full size models. With 2 steamers and 1 hot water outlet, the Synchro commercial espresso machine is fast becoming a popular machine that combines smart looks and good price for sites with more limited space and budget. Machines of this type offer both the hiss and clank ‘theatre’ of ‘crafting’ a perfect flat white, espresso or latte machiato and the very visual statement of quality speciality coffee for your outlet – we also install the Esprezzi, Iberital, Fracino and La Cimbali range of 2 group espresso coffee machines. 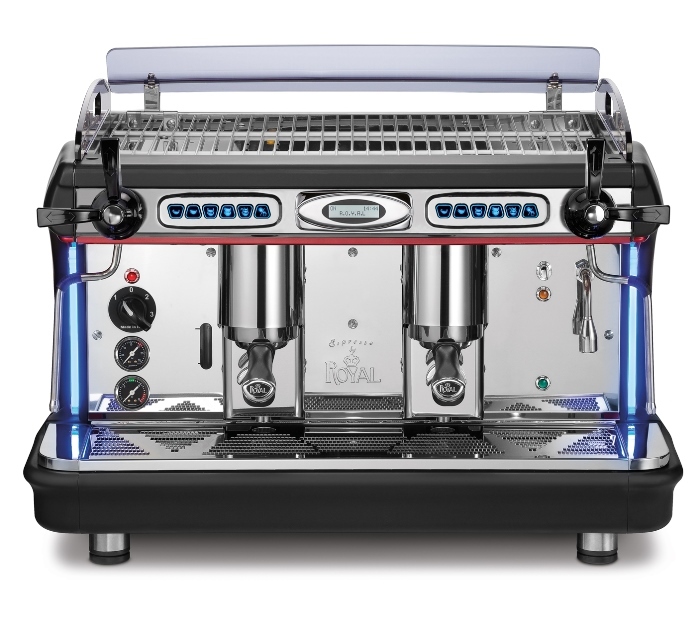 Royal Synchro coffee machines are hand made Italian coffee machines with the option of an individual boiler per group head. Offering precise PID temperature control for a whole new era of espresso brewing; they are attractively designed with a choice of colours in red, orange, metallic black or white – a truly stunning range of options. How do you acquire a commercial espresso machine the best way? Well, a popular way is to place the equipment on a finance deal over a 3 year lease rental arrangement. This means you do not have to fork out a large initial sum but rather the payments are spread out over the 3 year term subject to status; they are also all 100% tax deductible as well. Caffia Coffee Group have a great range of 8 types of espresso coffee beans including both Rainforest Alliance and Fairtrade certified blends – want a sample of our prime Caffia coffee beans? Please get in touch by email! We can assist you with all your commercial cappuccino coffee machine needs; please call 01324 617618 to talk to a friendly and laid-back family-run coffee company, we can advise, supply, integrate and offer barista training and quality point-of-sale material, coffee and ancillaries. 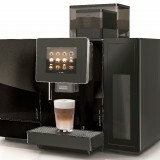 What is the best cappuccino machine for you? There’s one key element across over 150 manufacturers of commercial espresso coffee machines across the globe… and that is pressure. The concept of an espresso machine originated in Italy and the key point is high-pressure extraction of intensely flavoured and concentrated coffee in short measure. This strong brew has spread from Italy to the wholeworld as a favourite coffee fix. With the Caffia range of beans it comes in a variety of taste styles but should always have a good ‘crema’ – the emulsion of coffee oils that floats on top of the drink (it’s a good idea to stir your espresso with a spoon to blend this in). As you probably already know, the coffee beans are ground to a fine consistency and ‘tamped’ (pressed firmly) into a strong handle which is known as a group handle or portafilter, this is not unlike a very small and rugged saucepan. Once secured in the group head on the espresso machine by means of a quarter of a turn the machine’s pump is triggered to force water through the ground coffee at around 140psi (although at a low flow rate) and the result is this intense extraction. Barista Skills That We Give You. Milk heating, foaming and texturing are undertaken by the barista with the machine’s steam arms – this is a skill that takes practice but don’t worry – we train you on all of this. Strong points of espresso machines are smart looks that shouts ‘we sell good coffee’, good cup warming storage, good ‘theatre’ as customers can see the drink being crafted for them, good prices and robust performance. Also consider that these machines do take time to make a drink as well as quite a bit of skill acquired by practice – also with a human operator (s) there can be a degree of inconsistency in the end product. It’s fair to say that traditional espresso machines are rare in the office setting as they are not really automated enough to be convenient for staff drinks. We stock a range of commercial cappuccino machines and grinders for quick dispatch and installation anywhere in the country! Want a sample of our coffee beans? Please get in touch!